Even though I have lots of information on my pages already, I felt that it was not adequate to just put some stats out there and not keep everyone informed of other items of attention. I am not exactly sure what this page will contain, but it will probably be a mix of things, such as paint schemes, neat news articles about Jeff, weekend schedules, and upcoming events. Stay tuned! NOTE: All times are U.S. CENTRAL time zone. Friday, May 16 - Qualifying from 5 to 7 p.m. on SPEED. Saturday, May 17 - The Winston Open from 6:30 to 8 p.m. on FX. - The Winston from 8 to 9 p.m. on FX. 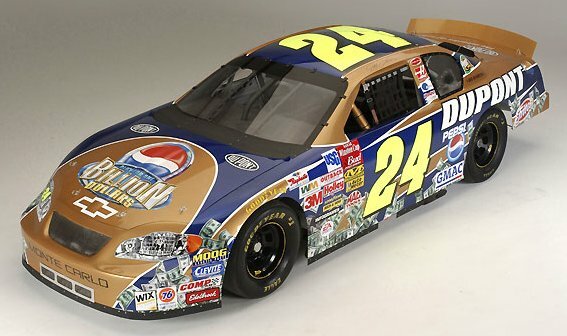 2003 Phoenix International Raceway - Looney Tunes: Several Looney Tunes characters will invade Jeff Gordon's normal Fire-and-Flames schemed Dupont Chevrolet when the Winston Cup drivers head to Phoenix International Raceway for the November 2 race. This is the third consecutive year in which Jeff has driven a Looney Tunes car (the previous two were at Richmond), but this time, the normal base scheme with the flames will still be on the car, with the special decals incorporated around the flames. 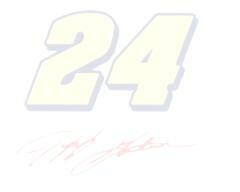 Here's the diecast car image, thanks to Jayski (4-25).